When any one of these parts are not working correctly it can cause problems and leave you on the on the side of the road. On average, an auto battery will last 3-to-5 years, but driving habits and exposure to extreme elements can shorten the life of your battery. We can check your battery charge so that you know how much car battery life you have left. 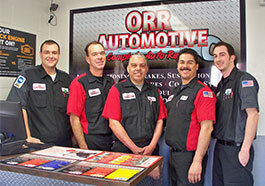 Orr Automotive is located in Montclair and will help you go the distance wherever the road leads.